Tentworld: OZtrail Blitz Tents! Quality super fast pitching tents! 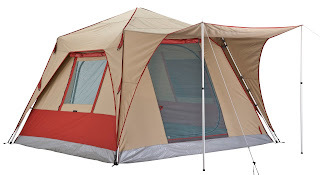 The Oztrail Blitz tent range is now in its 2nd year of production and what a beauty it is! OZtrail, known for reliability & quality and all for the best price have done it again with the Oztrail Blitz touring tent range. The OZtrail Blitz 240 Touring tent is really quick to pitch and perfect for a touring holiday or long term! The Blitz tents all feature tough built-in frames that make these tents really fast to put up! Hands down 10x better than putting up a dome tent! Watch the video below showing the set-up of the Blitz touring tent! The Blitz tents are not only quick to put up, but they're made from quality materials that will last the distance. The inner is made from SatProof 600+ rip stop canvas and the fly is made from 800+ rip stop canvas. Rip stop canvas is the best canvas type in the market today, it is a poly cotton blend that has a check plate weave that prevents your tent from ripping. If your tent is unfortunate enough to be jagged by a branch or similar! OZtrail have backed up their Blitz touring tent range with a two year warranty. series available at Tentworld Stores.